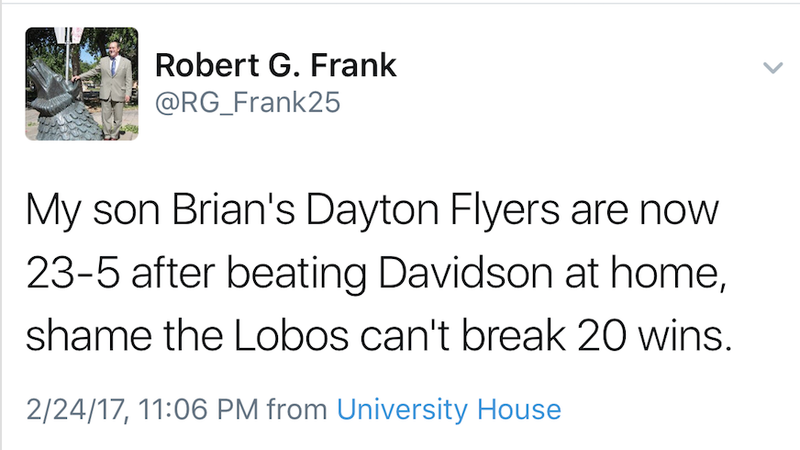 As you may recall, Frank recently stepped down from his president’s post at UNM after threatening to sue the school for a “false and defamatory” internal audit (of dubious integrity), which was leaked to the Albuquerque Journal. The audit had been commissioned by UNM’s Board of Regents, which was angling to terminate Frank with cause. The parties eventually resolved to allow Frank to take a $190,000/year position at UNM’s Health Science Center. More recently, Frank took his name out of the running for the president’s job at Ohio University. He is in the midst of a five-month sabbatical, during which time he is being paid at his UNM presidential salary rate of $362,136/year. In an interview with the Journal in December, Frank said he was heart-broken over the way in which his presidency came to an end at New Mexico. We sent a public message over Twitter to Frank, asking him why the anti-Lobo tweet was deleted (which is really a question of why the anti-Lobo tweet was tweeted). A source noticed that, prior to it being taken down, Robert Frank’s son, the aforementioned Brian Frank, “liked” it. We’ll update the story if Frank responds — or if he posts any more perspicacious tweets. Anyway, don’t fret: all’s hunky-dory in Loboland. UPDATE: UNM Athletic Director Paul Krebs “liked” the following tweet posted by @TheLobolair. If only passive aggressiveness could be commodified, UNM Athletics would be running in the black. In latest episode of The Weekly Howl podcast, we delve into the athlete exit interview debate. Exclusive: After 15 months of silence, the accused ex-Lobo basketball staffer finally tells his side of the story.